AT&T has been going at it strong versus other competing big-brand names: Verizon, T-Mobile and Sprint. If you’re here in search of which network is the best, we’ve got you covered with our reviews for Verizon, T-Mobile and Sprint. Without further ado, here is our review for AT&T. We’ll be discussing each plan based on their pricing and individual perks. AT&T has a good selection of plans from sole individuals to a family of five. Whatever you prefer to choose will depend upon your situation. Every plan is good on its own such as the AT&T Unlimited &More Premium which offers a lot of exclusive perks and the AT&T Next which is a plan that lets you get incredible discounts on your next phone purchase. As always, we’ll be sorting out the plans based on their types like Unlimited, Family and Prepaid along with 2 new miscellaneous additions: DIRECTV and Next. AT&T Unlimited &More and Unlimited &More Premium are both good but the more lines you add, the more you’d start to feel like the prices are higher than standard unlimited plan costs despite the piles of perks. AT&T Unlimited &More is their basic unlimited plan for anyone who’s just starting up with AT&T. The plan honestly has its many ups and a few downs but in any case, it’s decent. Not the best but it still has nice perks for the price. Comparing this to other competing plans like T-Mobile ONE, Sprint Unlimited Basic or Verizon Go Unlimited, it’s more on the pricier side as much as Verizon’s Go Unlimited. For what it’s worth, it’s a decent price especially if you don’t mind the absence of the mobile hotspot. After all, you’re paying for AT&T’s trusted consistency in network and speed. Not to mention the 5G will exist anytime soon and being under AT&T’s service while that happens will put you in a good spot of a righteous network. With the inclusion of the incredible WatchTV app that has more than 30 good channels and monthly discounts, this is a must for TV fans IF you don’t mind watching in SD quality. You can save $15 every month when you’re subscribed to their exclusive DIRECTV NOW offer which is $40/mo. Another great part about their billing is that they don’t charge you or cut you off for going beyond the limit. It’s a shame that it doesn’t have any limited GB of unthrottled data. However, internet speed throttles on busy days. As for apps, you get to have the WatchTV app for free. Again, it has more than 30 channels in it, each of which is very good and none of the useless ones from some cable providers. Streaming quality, however, can only be in SD. But if you’re not a pixel-savvy viewer who wants to see Donald Glover’s every detailed strand of hair in Atlanta, then this is fair enough. It does, however, have its share of reduced resolution on video playback quality that can occur at any time. But if you’re looking for 1080p, go with the &More Premium instead. For just one line, it’s just a $10 difference from the basic &More but suddenly leaps the price differentials more and more as the lines add up. You’re looking at a $20 price difference from &More when it comes to 4 lines. But is the bigger price worth the money? In many cases versus the basic &More, yes. Just like &More, AT&T will never cut off your data or automatically charge you for overage. And for the DIRECTV NOW subscription, you get to save $15/month when you’re in the &More Premium. Think of &More Premium as the former &More’s bigger and better brother with more gifts for avid TV viewers as much as Santa Claus leaving gifts under the Christmas tree. With every perk that can make a couch potato cry as well as adding in a nice chunk of discount for DIRECTV NOW, &More Premium is more suited for the TV geeks who want nothing more than HD streaming along with AT&T’s already formidable network quality. We’re happy to say that AT&T offers a lot of perks for the TV fans. But for anything else, not so much. With the already-excellent AT&T network, subscribers will have a bonus 22GB data. Once the first 22GB have been depleted, that’s when speed throttles. You’re also given a mobile hotspot filled with 15GB of data. Once it’s depleted, the hotspot speed is limited to 128 kbps. The biggest highlight here are the entertainment aspects: we’re talking about pure 1080p HD quality with a bunch of exclusive stuff that you can only find in the &More premium. Besides the WatchTV app, you get to choose an additional channel for it. This includes any of the following: HBO, Cinemax, Showtime, Starz, VRV (full of the best animated shows), Amazon Music and Pandora. The resolution only reduces once all 22GB of data have been sucked up. Is it a good deal then? Of course it is. But just take note this is still much more expensive than Sprint and T-Mobile’s offers however those two don’t have as many perks as AT&T’s. With all this talk about DIRECTV NOW, let’s have a quick discussion about it. DIRECTV NOW is an internet TV plan that starts at $40/month for more than 65 channels up to $75/month for more than 125 channels. No matter what you choose between AT&T’s Unlimited &More or Unlimited &More Premium, your monthly payment for DIRECTV NOW will always be $15 off. I would like to give supervisor in the Caribbeans office Ms. **, a 5-star. She went above and beyond her job title to help me Resolve my issue, to get me the best rate possible, to listen to my concerns. She was so caring she made me cry. I was having such a bad day that day but after I hung up the phone with her my day went wonderful from then on out. She searched the computer. She spent I don't know how long to help me with my billing. Not only did she help me with my billing she made my whole day. She is phenomenal. When it comes to DirecTV this is the company to go with. They are honest, reliable and the cheapest cable provider that you can have. My picture, my sound is phenomenal. I love DirecTV. I have not ever had good cable service that I have now thanks to DirecTV. Ms. ** she has to get a 5-star because she went above, above and above her job title at DirecTV to make this customer happy. Have a blessed day. I will be moving next week and I needed to transfer services to a new home. I spoke with Mitch, he went above and beyond. It took a while for updates on the computer so while we waited, we had great conversations. We spoke about jobs and children and life in general but the one thing that stands out was him mentioning to me that prayer is the number one thing that protects us. I know in this day and age a lot of people are afraid to bring up the topic. Afraid of rejection, afraid of retaliation or discrimination. I am so very grateful for our conversation about the Lord in a discrete manner. I'm usually the one witnessing to others. It was nice to have someone do it back to me. So Thank you Mitch for brightening my day. The lady with 6 kids. Lol. AT&T’s family plan is a good way to share or split the data among every family member in the household. With some nice perks such as HD streaming and a mobile hotspot for up to 10 devices, it’s honest to say that their family plan perks are much better and even cheaper than Verizon’s. We’ll go straight right off the bat here: the 10GB mobile flex plan is the most ideal family plan in this list. Why? First off, it’s better than Verizon’s 8GB for $75/mo family plan and much more worth it than Sprint’s 2GB for $45/mo. It may not be as cost efficient as MetroPCS’ family plans and with the exclusion of its activation fees, but it’s still a great price for a family plan. Unlimited calls and texts locally, HD streaming and no overages, this is truly a much better plan than having to subscribe to the family plans of Verizon. Sure, it slows down to 2G speed but it’s better that way than having to pay a lot for a measly 1GB, right? Not to mention this is up to 10 devices too. So while the youngest child is up in his room watching 3 hours of Baby Shark videos and you have Mommy texting with her friends, AT&T has enough data to allot for the family. We love that AT&T still has the knack to still include a nice HD streaming perk for their mobile flex plan. Other telecom companies would just only have SD streaming, unlimited calls and text, and that’s it. While the price may not be as pleasing to the eyes as MetroPCS, you have to hand it to AT&T for improving their prepaid plan after years of ridicule. But with autopay discounts, carryover data and a nice starting price, GoPhone is a good budget cell phone plan that still has the same great AT&T network quality. Mobile hotspot tethering is also available up to five devices too. While the perks may not be el grande as their Unlimited &More plans, it’s still a more cost-efficient plan especially for Mommy and Daddy who are having a tight budget. Sure, the prices may seem too much just for a prepaid plan but remember: no other prepaid plan has the same network consistency as AT&T. It may still be 2nd versus Verizon but its prices and offers for prepaid are much better than Verizon Wireless. Just look at what you’ll get at just $40/mo alone: 8GB of data plus a mobile hotspot, unlimited calls, texts and even HD streaming. You won’t get that anywhere else. Their 8GB data is our most recommended prepaid plan if you wish to have the best of AT&T’s quality and saving enough money. And then there’s the prepaid unlimited plans. Their GoPhone $75/mo unlimited plan has all the good unlimited goodies plus 10GB data for the mobile hotspot. Although we still recommend you get their &More postpaid plan instead than this one since the savings are just only a little. In any case, this is more worth it than even Verizon, Sprint or T-Mobile’s prepaid offers. Where else can you get so many perks for just a prepaid plan? However there is a downside here if you wish to buy a brand-new phone: the offers aren’t ideal at all. For some reason, they just don’t have any available prepaid plan on their latest phone offers. You can, however, bring your own phone as long as it works with AT&T but you might have to pay for a new SIM card. As previously mentioned, AT&T has more prepaid perks than other networks which makes this a worthy competition versus MetroPCS. On the 8GB plan alone, you get a lot of perks for only $40/month ($50/mo if you don’t have autopay activated). Don’t bother with their 1st prepaid unlimited, though. You don’t get any of that mobile hotspot or HD streaming alone unless you’re the type that doesn’t bother such things and prefers the unlimited call, text, and data. The 2nd prepaid unlimited is quite good on its own but if you’re paying for $75/mo just for that, why not just go with their &More Premium instead for $80? It’s just only a $10 difference anyway. In conclusion to the prepaid plans, if you’re already satisfied with AT&T’s service but prefers being on a budget with limited data, the 8GB truly is the most solid choice for you. If you’ve decided to choose AT&T, chances are you’re going to be introduced to an exclusive phone plan: The AT&T Next. This plan is exclusive to their latest phones such as the ongoing Apple iPhone and Samsung Galaxy Note. It’s a more complex system in which you can get the phone now and have to pay on a monthly basis for either 30 months or 24 months with some other discounts. It’s divided into two categories: AT&T Next and AT&T Next Every Year. The first one, AT&T Next, is an upgrade of the phone series every two years by just trading your device and having to pay for it for 30 months. The second one, AT&T Next Every Year, is already stated as it is. You get a new phone annually by swapping your previous series and pay for 24 months. They even offer huge discounts as much as 75% on their latest devices by following their own guidelines. Take a look at their Samsung Galaxy Note 9 75% discount offer, for example. When I was first signing up and had questions, customer service was very accommodating. I have the prepaid plan which is $45 and I get a $5 discount because I use autopay via my credit. It ends up being $44.86 with the tax. I have 6GB of data at high speed and then it slows down, but I never use 6GB, as a matter of fact I never use 2GB because I have wifi at home and most places I am have wifi. When I have to use data, it is usually pretty quick and easy to use. I have had a Samsung Galaxy 3 with AT&T service for the past several years. Coverage is very good and calls do not drop. It is hard to reach live customer service, but once I do they are very helpful and polite. I am very happy with AT&T. I've been with AT&T for over 30 yrs. Tried another company but came back. No dropped calls, great plans with reasonable rates, and a wide variety of phones. Great service. You can, however, only be eligible for their Next plan if you subscribe to at least a $65/mo plan. For us, it’s a good offer knowing that they present large discounts for customers plus all latest phones are backed up by their good network. It’s a neck-and-neck competition for us between this versus Verizon’s smartphone offers as they present identical plans regarding the latest devices. 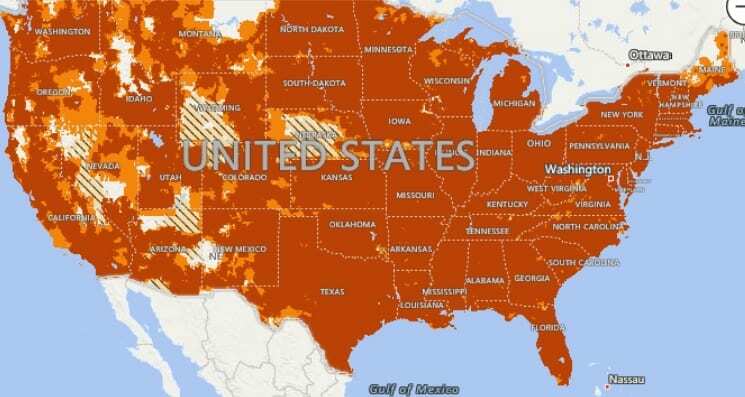 As for coverage, while the company may cover a very large part of America, you still might want to check their official map if you’re in range because if not, you’d have to either move to a covered area or just find another telecom company. It’s not as vast as Verizon but it still covers up a lot of the country. Just take a look at their official map coverage if you want to zoom in where you currently are. If you need to contact them, you can go through here. As for the customer service, it doesn’t bid very well either. You either get a rude AT&T representative when you call them up or nobody to reply to your message or call at all until several days later. Bills are very important to always be accurate in the monthly payment. The most common complaint of users is the company’s questionable additional payments in the bill. It’s a given that any telecom company customer service is not good at all but for AT&T it can get pretty scary at some point. This is most especially because of the autopay and paperless billing that they charge you for: the big issue here is that, according to many folks, they charge you for the wrong plan or without any inclusion of discounts. And to top it all off, the representatives take too long to respond to you whether on landline or email. For what AT&T is good at in their network, they need to improve more on their customer care. Yes, especially if you’re looking up to the best price when it comes to TV offers. Just be reminded that you have to subscribe to their autopay and paperless billing if you want the discounts. For what AT&T lacks in decent pricing and poor customer care, they make up for the high price with great internet speeds and strong signals. Let’s not forget the fact that AT&T is the very close second to Verizon when it comes to remarkable network. Also it’s only overpriced IF you’re not into their TV service perks at all since we have to admit, has the best TV streaming perks versus Verizon, Sprint and T-Mobile. It may not be as the big boss as Verizon when it comes to coverage and unlimited plan perks but it’s still a great network. With tons of discounts on every plan along with the HD streaming and budget-friendlier offers than its counterparts, AT&T has proven to be a formidable company. How is AT&T’s network quality? It is one of the stronger companies that deliver consistently good network speed and very decent national coverage. People choose AT&T mainly for the many perks it gives to its users on a monthly basis. How is AT&T’s network speed? When it comes to consistency, no other telecom company does it better than AT&T with a constant speed of more than 10 Mbps in the metro areas alone. Is AT&T as expensive as Verizon? Quite frankly, yes. The biggest downside of AT&T is its pricing. Much like Verizon’s endless options of plans from unlimited to prepaid, all of AT&T’s plans can be seem so daunting to the point where users thought it would have been better off subscribing to Sprint instead. Are the activation fees expensive? How much do they cost? The biggest yikes in AT&T are the dreaded activation fees. No, these are not included in your phone plan and it’s going to cost you $40 to $45. So if you can’t manage to allot that price, you better look somewhere else. I have good experiences with AT&T and their customer service is excellent. I have internet from them as well and again exceptional service as always. I would recommend AT&T to family as well as friends. I am really happy with AT&T and I have never had a problem with my service. The customer service is really good and have always been able to help me no matter what I call about. They will help you when you are transferring your number to their plan. If there is a problem that will get it resolved. They will stay with you till things are done.